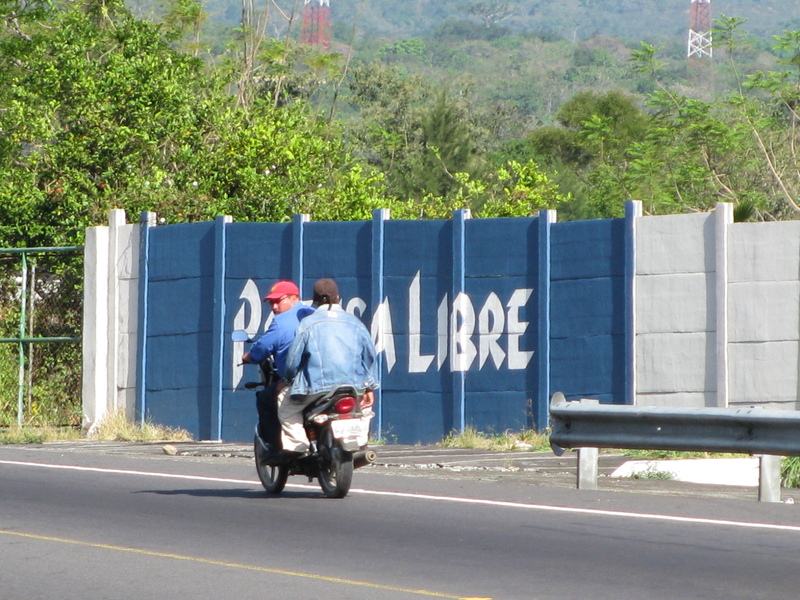 I can’t believe it has been over three years since I was in Guatemala—it seems like yesterday. And I will never forget the day I climbed my first volcano. 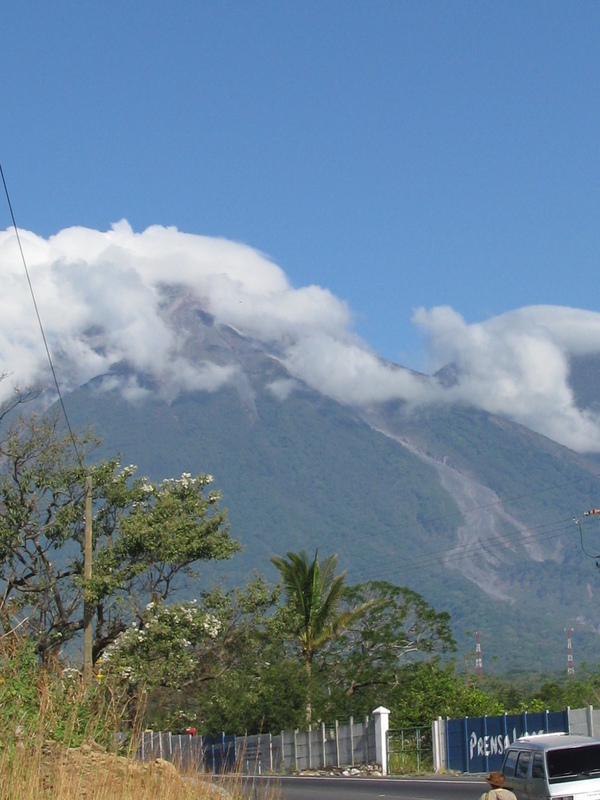 To be clear, it’s still the only volcano I’ve climbed, but I hope not my last. However, the adventure began before we arrived at our destination. We joined a group of people for the volcano experience. I had heard it was best to go with a guide—safer. So that’s what we did. Our group filled two small vans. The drive was over an hour and wouldn’t you know it, one of the vans got a flat tire. I’m going to be honest, when I still had a car I was the type to call for help when I got a flat. And I don’t mean my dad, who would also call someone else for help. I love that the men are watching and the gals have their backs turned. van. Not to help. But to watch. There was one gentleman in the group who wanted to help. Unfortunately for him, the guides said he couldn’t help due to liability issues. This didn’t satisfy the man. He was the helping type, especially during a crisis. We were on a highway and while I didn’t feel I was in danger, I wasn’t the one changing the tire. Not too many cars drove by, but there was still some traffic. Two onlookers going in the opposite direction. The curve in the road. To be clear, this isn’t the gentleman making his road block. 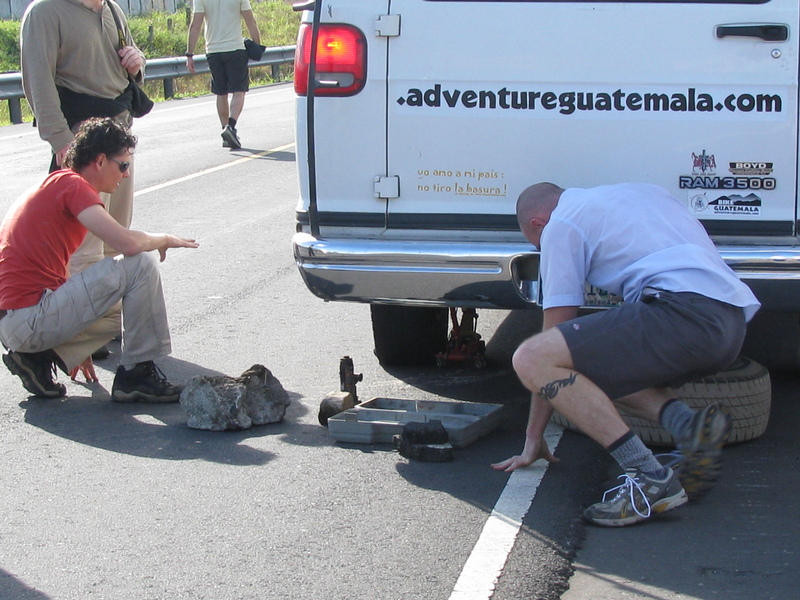 It’s one of the guides searching for a rock to help with the tire-changing process. The gentleman was quite concerned about safety. He started to collect litter. An empty cup, a Coke can, and other small objects. I watched, curious about his behavior. Then he walked past the curve and I lost sight of him. When he turned the corner I noticed he was placing the litter in the road like you would set up orange plastic cones to alert drivers about an accident or obstacle in the road. His barrier created a safety bubble for the guides. He was helping; I had to give him that. And he didn’t have much to work with. When the first car flew by all of his rubbish flew away. Undeterred, he gathered more and placed it in the road once again. The next car demolished all of his hard work. Some of the other hikers noticed him and his efforts. No one said anything, but I could sense they wanted to laugh. After his third attempt the dude gave up. None of the drivers paid any attention to his road blocks made of empty soda cans and cups. He looked defeated. Fortunately the spare tire was on and we were ready to roll. During all the excitement, the view was lovely. 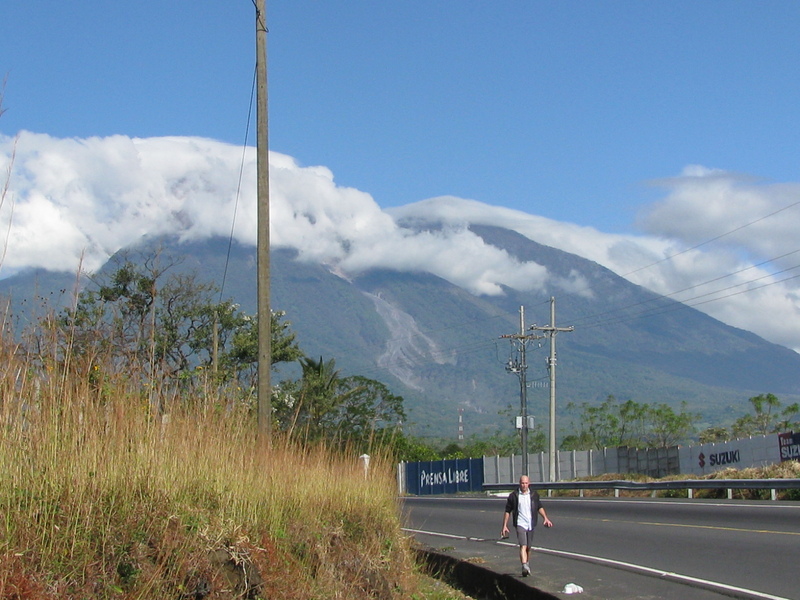 This entry was posted in Travel Stories and tagged 50 Year Project, Blog, Blogging, Flat Tires, Guatemala, Guides, Hiking, Hiking a Volcano, Humor, Life, Pacaya Volcano, Photography, Photos, Road Hazards, Safety, Travel, Travel Blog, Travel Journal, Travel Photos, Travel Stories. Bookmark the permalink. On the inside I was chuckling. I didn’t want to laugh out loud and embarrass him since he was trying so hard to be of use. Wow, he tried so hard. What a nice guy. It always scares me when there is an road emergency and people do not realize it until they are on top of the road emergency. How funny. I bet that is why the ladies had their backs turned so you wouldn’t see them laughing. I know if I were there I would also be taking pictures with a chuckle bubbling up inside of me. Hope the climb went well. It was hard not to free the chuckle inside. Very hard. The hike was great, tough, but beautiful. Well I guess he wanted to DO something!!! And since those mean guides wouldn’t let him change the tire he had to find something to do!!! Funny that is what he chose!!! Lovely pictures and it looks like a great place to visit! I wouldn’t even have thought of making a barrier. I had to give him credit for that. Interestingly, a friend of mine (a native Guatemalan), is there now visiting her family. …. and she talks about the beauty of her land! It’s a stunning place Frank. I hope she is enjoying her visit. I wish i had more time to visit; you always take me to the coolest and most “human” places and moments! Once your writing career takes off you’ll conquer the world Hook! Oh bless – I’d have been the one bossing everyone else around but not doing anything actually physical you understand! LOL–that’s fine as you yell at me to do nothing 🙂 I excel at doing nothing in these types of situations. I hope it helped him to try! I couldn’t tell. he was the quiet type. A brooder. And to be honest, I was busy huffing and puffing during the hike I didn’t talk much to people. It is not easy to be the helping type and be told that you can’t help. I feel for the guy, but at the same time I feel for the tour group who probably wished that he would just stay still and be safe. Sometimes helping is doing what others ask you to do, even if that means doing nothing. I agree Carl. His actions made me a little nervous. I understand his need to be helpful, but like you said, you have to be helpful in a safe and productive way. I agree with Carl. Anyway, I can see that Guatemala is absolutely beautiful. And what is the name of the volcano? We hiked Pacaya. it was an amazing experience. I talk more about it next week. “I talk”. Isn’t it “I’ll talk”? I’m glad he tried to alert other drivers to the situation. Amusing! But I would be nervous changing a tire on the side of the road like that. I was surprised they didn’t have any type of cones or flares. They drive these vans all over and on back roads. Things happen. And since they are transporting clients you’d think they would be more prepared. Can’t fault the actual guides though. They were fantastic. And they are the ones who have to deal with managers who don’t protect them completely. Your country is so beautiful and the weather is perfect. I like warm, not hot days. yes, always be careful on the highways. I’m a California girl–they don’t mess around on the highways. Follow the rule of the road or the citizens will “take” care of you 🙂 Have you ever seen the movie LA Story with Steve Martin. It’s an oldie, but you might appreciate the humor since you now live in my home state. I hope you’ve kicked the flu completely! I do miss the place. Laguna beach was my fave. what a story! it’s really something to remember. I think I would behavw just likebyou, I want to laugh but would contain it because it would make him sad. I think he’s a lovely man. I wouldn’t want to hurt anyone’s feelings. Now I smiling when I think how hard he tried.